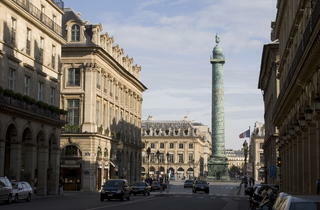 Elegant place Vendôme got its name from a hôtel particulier built by the Duc de Vendôme that stood on the site. 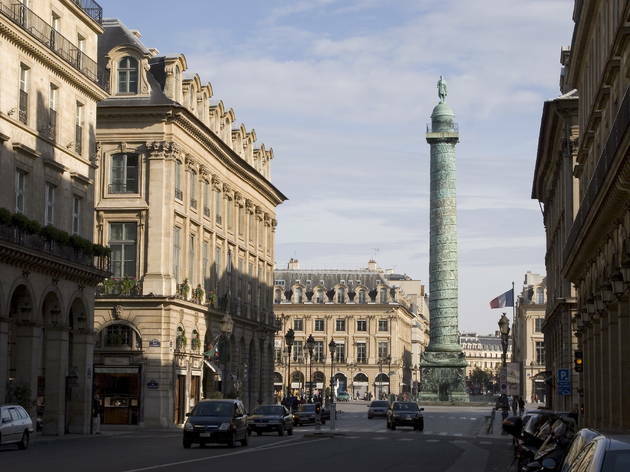 Opened in 1699, the eight-sided square was conceived by Hardouin-Mansart to show off an equestrian statue of the Sun King, torn down in 1792 and replaced in 1806 by the Colonne de la Grande Armée. Modelled on Trajan's Column in Rome and featuring a spiral comic strip illustrating Napoleon's military exploits, it was made from 1,250 Russian and Austrian cannons captured at the Battle of Austerlitz. During the 1871 Commune this symbol of 'brute force and false glory' was pulled down; the present column is a replica. Hardouin-Mansart only designed the façades, with their ground-floor arcade and giant Corinthian pilasters; the buildings behind were put up by nobles and speculators. Today the square houses sparkling jewellers, top fashion houses and the justice ministry. At no.12, you can visit the Grand Salon where Chopin died in 1849; its fabulous allegorical decoration dates from 1777 and has been restored as part of the new museum above the jewellers Chaumet (01.44.77.26.26).